Outlaws, the professional CounterStrike team owned by sportsbook provider Ultraplay, have denied any involvement in an alleged match fixing scandal. Esteemed esports journalist Richard Lewis has unearthed claims that four CounterStrike matches were rigged, including two in which Outlaws took part. These matches, which took place between January 30th and February 24th 2017, include their quarter final of the Finnish LAN event Assembly Winter. Whilst CSGOBetting.com has doubts about the truth of these allegations, if proven to be valid, their impact will extend far further than possibly anticipated given that Ultraplay is a prominent white label software provider, which is also believed to operate its own tournaments on which betting is offered. It is alleged by Karim “tropica” El Amrani, an administrator of a private Facebook group where semi-professional teams arrange practice matches, that Outlaws threw one map in their best of three series’ against Epsilon Hype in the Hellcase Cup 2 Closed Qualifier, and against iGame in their quarter final at Assembly Winter, an event at which they went on to place second, winning $4,000. El Amrani claims to have placed winning bets on both matches. The Bulgarian side, who are referred to on the white-label and operator’s website as UltraPlay OUTLAWS talent academy, went on to win both games 2-1. El Amrani came to the attention of Lewis after he approached Team Paria to encourage them to fix a match in King of the North, a small online tournament. When challenged by Lewis, he claimed that he is a match fixer that has been in operation for around six months and has earned $20,000 since the start of 2017. It is worth noting that in his initial conversation with Paria’s manager that he did not offer to pay them to fix the match, but instead implies he can show them how to place bets on themselves losing. El Amrani had already claimed that “most” King of Nordic matches, for which Outlaws are ineligible, and ESEA Premier matches, which Outlaws are not qualified for, are fixed. It is alleged bets were placed with NordicBet, who are currently investigating the claims. El Amrani claims to have placed bets of between $700-900 on these matches, however it is very difficult to believe that NordicBet would have laid wagers in such size on unimportant matches, given that they are a recreational bookmaker. Further, it appears that at least one of the bet slips shown to Lewis is likely forged. Firstly, the alignment / font appears to be incorrect on the betslip, shown below. Secondly, the betslip, placed at 19:29, which we assume is Finnish time (i.e. GMT+2), given El Amrani’s location, shows an ID of 2227941869. 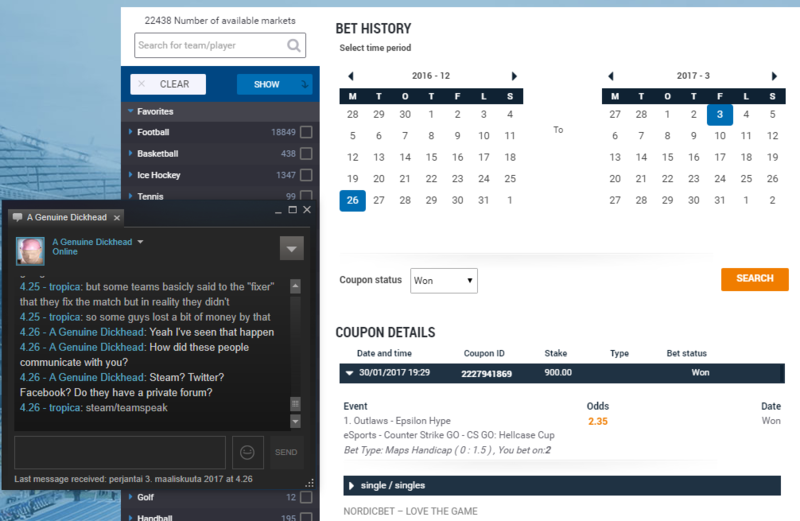 However, CSGOBetting.com’s owner had placed an unrelated bet with a sister site of NordicBet’s at 17:47 GMT, which shows an ID of 2227925867. It would be expected that the later the bet is placed, the higher the ID. CSGOBetting.com’s expectation is that even if the matches were fixed, that these claims regarding earnings are exaggerated, though El Amrani does also allude to placing bets with Bitcoin. Incidentally, with the exception of Nitrogen Sports, the most well known websites accepting Bitcoin wagers on CSGO, such as VitalBet, gg.bet and eBettle, are operated by Ultraplay. VitalBet is also listed as a sponsor of Outlaws. In Q1 2016, UltraPlay took over 130,000 CSGO bets across just three of its clients. There is currently no evidence to prove El Amrani’s claims but if true, questions have to be asked as to whether Ultraplay was aware and if indeed, as their website claims, “traditional bookmaking in eSports is impossible”. It is also alleged that in two other games, a Finnish team threw a match to a Swedish mix team, and that Rush3d fixed a match to lose 2-1 against Fragsters.